Traditional and comfortable inn situated in the village of Kippen, Stirlingshire. We serve food all day from soups to sirloins, with home made pies and puddings to finish. Every Sunday is roast day featuring two types of roast.Children Welcome. 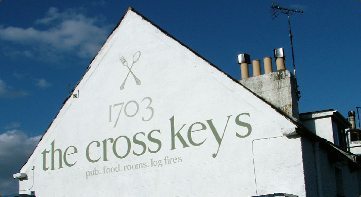 The Cross Keys in Kippen is located amongst some of Scotland’s most picturesque scenery and between the Loch Lomond and Trossachs National Park, with the city of Stirling only minutes away. Not only is the area steeped in history, Cross Keys is the oldest inn of its kind in Stirlingshire, as traditional as it gets, making it an ideal getaway destination or a great stopover for those going further north or returning south. 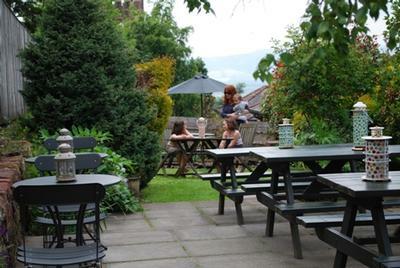 The pub has log fires in winter and the beer garden has great views in summer, and is an ideal place to relax after walking, cycling, golfing, or fishing. 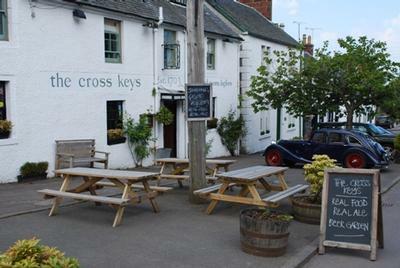 Food at the Cross Keys is traditional modern with standards and specials side by side, served untill 9pm in the bar, lounge and restaurant, which merge together into a large, spirited eating and drinking space where effusive locals, chatty families and serious foodies come together to enjoy a unique village atmosphere. Sundays are roast day with two types of roast prepared that morning. 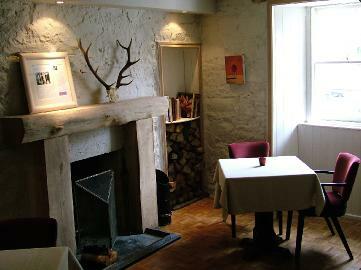 Award-winning Gastro Pub of 2009. The name kippen derives from the Gaelic (indigenous language of the Scots) word meaning ‘place of the little stump or outcrop or block’. This refers to the geological nature of the village of Kippen which sits on an outcrop of the Gargunnock Hills. Please call or contact us by email using the links to make a reservation.